A new system devised by MIT engineers could provide a low-cost source of drinking water for parched cities around the world while also cutting power plant operating costs. About 39% of all the fresh water withdrawn from rivers, lakes, and reservoirs in the US is earmarked for the cooling needs of electric power plants that use fossil fuels or nuclear power, and much of that water ends up floating away in clouds of vapor. But the new MIT system could potentially save a substantial fraction of that lost water—and could even become a significant source of clean, safe drinking water for coastal cities where seawater is used to cool local power plants. The principle behind the new concept is deceptively simple: When air that’s rich in fog is zapped with a beam of electrically charged particles, known as ions, water droplets become electrically charged and thus can be drawn toward a mesh of wires, similar to a window screen, placed in their path. The droplets then collect on that mesh, drain down into a collecting pan, and can be reused in the power plant or sent to a city’s water supply system. The system, which is the basis for a startup company called Infinite Cooling that won MIT’s $100K Entrepreneurship Competition in May 2018, is described in a paper published on June 8, in the journal Science Advances. The paper is co-authored by Maher Damak PhD ’18, now a fellow in the Tata Center for Technology and Design, and Associate Professor of Mechanical Engineering Kripa Varanasi SM ’02, PhD ’04. Damak and Varanasi are among the co-founders of the startup, and their research is supported in part by the Tata Center. Varanasi’s vision was to develop highly efficient water recovery systems by capturing water droplets from both natural fog and plumes of industrial cooling towers. The project began as part of Damak’s doctoral thesis, which aimed to improve the efficiency of fog-harvesting systems that are used in many water-scarce coastal regions as a source of potable water. Those systems, which generally consist of some kind of plastic or metal mesh hung vertically in the path of fogbanks that regularly roll in from the sea, are extremely inefficient, capturing only about 1% to 3% of the water droplets that pass through them. Varanasi and Damak wondered if there was a way to make the mesh catch more of the droplets—and found a very simple and effective way of doing so. The reason for the inefficiency of existing systems became apparent in the team’s detailed lab experiments: The problem is in the aerodynamics of the system. As a stream of air passes an obstacle, such as the wires in these mesh fog-catching screens, the airflow naturally deviates around the obstacle, much as air flowing around an airplane wing separates into streams that pass above and below the wing structure. These deviating airstreams carry droplets that were heading toward the wire off to the side, unless they were headed bang-on toward the wire’s center. The result is that the fraction of droplets captured is far lower than the fraction of the collection area occupied by the wires, because droplets are being swept aside from wires that lie in front of them. Just making the wires bigger or the spaces in the mesh smaller tends to be counterproductive because it hampers the overall airflow, resulting in a net decrease in collection. Next, the team focused on capturing water from the plumes of power plant cooling towers. There, the stream of water vapor is much more concentrated than any naturally occurring fog, and that makes the system even more efficient. And since capturing evaporated water is in itself a distillation process, the water captured is pure, even if the cooling water is salty or contaminated. At this point, Karim Khalil, another graduate student from Varanasi’s lab, joined the team. “It’s distilled water, which is of higher quality, that’s now just wasted,” says Varanasi. “That’s what we’re trying to capture.”The water could be piped to a city’s drinking water system, or used in processes that require pure water, such as in a power plant’s boilers, as opposed to being used in its cooling system where water quality doesn’t matter much. A typical 600-megawatt power plant, Varanasi says, could capture 150 million gallons of water a year, representing a value of millions of dollars. This represents about 20% to 30% of the water lost from cooling towers. With further refinements, the system may be able to capture even more of the output, he says. What’s more, since power plants are already in place along many arid coastlines, and many of them are cooled with seawater, this provides a very simple way to provide water desalination services at a tiny fraction of the cost of building a standalone desalination plant. Damak and Varanasi estimate that the installation cost of such a conversion would be about one-third that of building a new desalination plant, and its operating costs would be about 1/50. The payback time for installing such a system would be about two years, Varanasi says, and it would have essentially no environmental footprint, adding nothing to that of the original plant. In a series of dramatic proof-of-concept experiments, Damak, Khalil, and Varanasi demonstrated the concept by building a small lab version of a stack emitting a plume of water droplets, similar to those seen on actual power plant cooling towers, and placed their ion beam and mesh screen on it. In video of the experiment, a thick plume of fog droplets is seen rising from the device—and almost instantly disappears as soon as the system is switched on. 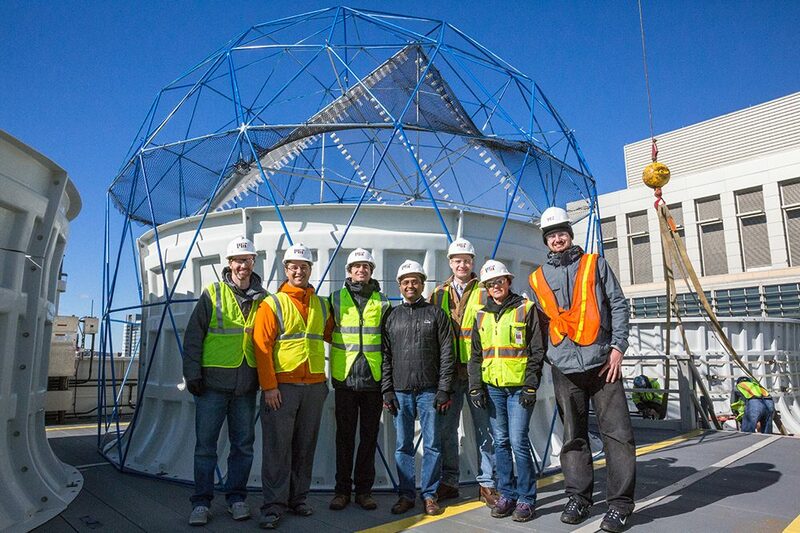 During summer 2018, the team built a full-scale test version of their system, and on October 18, they installed it on the cooling tower of MIT’s Central Utility Plant, a natural-gas cogeneration power plant that provides most of the campus’ electricity, heating, and cooling. Planned tests of the setup include trying different variations of the mesh and its supporting structure, Damak says.